15. k.m.krebs - beware tokyo! Each Sunday evening, from 6pm to midnight CST, we present a variety of independent, mostly electronic and/or experimental music for your listening pleasure, subdivided into two shows: "The Pirate Room", hosted by Jack Acid Sundays from 6-9pm CST; and "Greetings from the Aether", hosted by Splicer Sundays from 9pm-midnight CST. Just CLICK HERE at those times to have a listen. 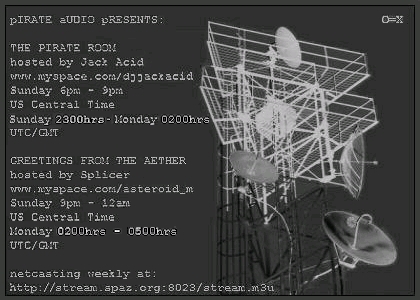 Each Sunday evening, from 6pm to midnight CST, we present a variety of independent, mostly electronic and/or experimental music for your listening pleasure, subdivided into two shows: "The Pirate Room", hosted by DJ Jack Acid Sundays from 6-9pm CST; and "Greetings from the Aether", hosted by Splicer Sundays from 9pm-midnight CST. Just CLICK HERE at those times to have a listen. shoutcast update - spaz soundsystem has don8ed server space for our shoutcast sessions, sundays 6pm - midnight. massive shout out to spaz for working with us.